She is both an Engineer and an Artist, but lately, her passion is about growing into a Naturalist. She creates healing teas, has to experience with growing plants and sprouting seeds and even brewing kombucha. Janaf is evolving into a medicine woman before our eyes! This yogini works to maintain a healthy, colorful diet full of fresh foods and she's working on breaking food addictions. Janaf is extremely passionate about becoming her natural self and being able to operate outside of the fear of disease and the influence of society and media. My preferred yoga style would have to be Vinyasa where the breath is so important. I love the way Vinyasa focuses on synchronizing breath with movement. I also really enjoy Hot Yoga because it is so cleansing to sweat that way. Age (if you would like): I am 28 years old. One of the magical 7ths! Currently, my favorite book is African Holistic Health by Llaila O. Afrika. I use it as a reference! I love words a lot, but my favorite word might be “deep” (anyone who knows me will laugh). City: I’m from PG County. If you’re from here, that’s a city. I started practicing yoga a few years ago. It was a huge transition period in my life, and I kept hearing about yoga in a strange context. I saw it everywhere randomly. Even my ex at that time had a new girlfriend that did yoga (like I said, transition period). Usually, if I hear something three times, I pay close attention to it. I loved it right away because I was claiming in my life that I wanted to seek peace. Yoga was my first experience with meditation, and that has been a major key to achieving peace in my life. One of my close friends began teaching yoga, which helped me enhance my practice. His instruction and cues helped me deeply connect with my mind and body. Going to a yoga class is great for exercise, but a personal practice is the best way to take the time to listen to your body and get deep into meditation. My practice is anchored in my journey to mastery of self. That is the entire theme of my life right now, and everything I am doing falls in line with that. I believe that I can conquer everything without from within. My surroundings are a reflection of all that is within me. A lot of the time I pray about this before starting practice. My living room is set up like a yoga studio. I like to turn on a portable heater because my house is cold (I’m cheap). I like to burn essential oils during practice and open the blinds to the huge bay window. I practice in silence; sometimes alone but often with my boyfriend. Now and then we’ll have friends over to share practice. Yoga impacts my life in a very real way on and off the mat. My body and spirit are learning to work together more cohesively in all things. It helps me to identify the spiritual battles that are hindering me in every area of my life. I will learn in practice that I am not brave enough or that I do not push myself enough. It forces me to win those battles within, and when I get into another arena, like at work, for instance, I am more eager to step out of my comfort zone. The most challenging aspect for me has been flexibility. I grew up not even being able to touch my toes so, needless to say, yoga challenges me on a daily basis. How does your practice impacts other’s lives? My practice mostly impacts the lives of others in ways hardly noticeable to them. As I grow and understand more about myself and my flaws, it makes me more loving and forgiving toward others that I come across. I can give and love endlessly if I always make sure my tank is full. Yoga has taught me a lot about perspectives. The whole easy vs. hard aspect when it comes to certain poses. The different comfort zones. Everyone is coming from a different place with things. If you respect where someone is coming from, they are more likely to consider growing forward with you. During practice, yoga makes me feel capable. Seeing my incredible progress tells me that if I stick to something, I can be great at it. Being naturally good at a lot of different things often makes me unenthused about any practice. Yoga shows me the injustice that I do myself (even if I “win” despite it all) when I am unwilling to practice. I now just strive to be my best self in all things. After practice, I feel relaxed. The body is pain-free. The mind is calm. The spirit is high. Yoga makes me feel together and balanced. Since I give my body what it needs during practice, it gives me new cues throughout the day. I may need to stand up and do a backbend at my desk. Sometimes, I even feel a need to be inverted to balance things out. "Do not allow physical limitations into your spiritual space." My advice for new yogis would be to focus on yourself when you practice. You shouldn’t see what anyone else is doing around you. It is not a competition; at least, not one that involves others. Focus on your breath. My advice for long time practitioners would be share. If you are hesitant to try yoga, maybe start by focusing on some poses that come to you naturally. Everyone has an area whether it is strength, flexibility, or balance that comes to them naturally. Maybe focusing on your strengths, to start, will encourage you to keep going. Also, you don’t have to do anything fancy at all. Just doing a few sun salutations each day can go a long way. How does/has your hair affect your practice? Embarrassingly, I didn’t practice yoga for MONTHS once simply because I was going through a phase of getting bulky hairstyles. I was looking cute, but my hair was hindering my practice. You can’t properly Savasana with a huge bun in the back. You can’t do headstands with a huge bun on top. Sometimes, you need access to all sides of your head to get a good practice in! It has been easier when my natural hair is free, but I still often practice with my hair wrapped up. When my hair is free, my hair can easily get flattened and tangled. The struggle is always real. I don’t have the answers to this one. My mental health and overall wellness are at an all-time high with yoga for all of the reasons I’ve already discussed, but there is always room for improvement. Even just taking the time to not over-stimulate with technology and all of the things that are constantly being thrown at me is a healing. These days, we always feel the urge to fill up every moment in-between moments. Yoga and meditation remind me that there is nothing wrong with having a moment to myself. I think yoga would be a great addition to any black person’s life, especially in these times. 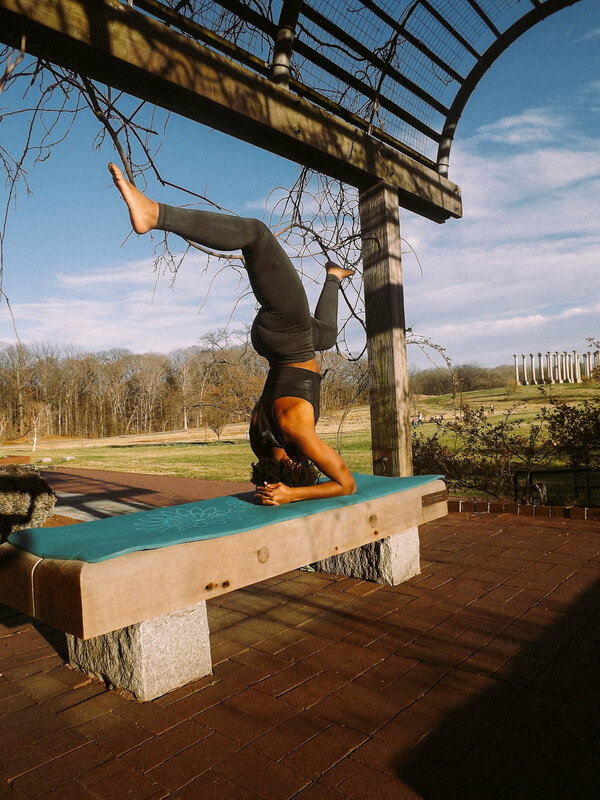 I wouldn’t know too much about Black Yogi stigmas because when I was going to yoga classes where I was often the only black person in the room, I rarely made connections with the other yogis. One thing I will say that I feel about the yoga sessions that I frequent now, which have black instructors, is that they are very personal. Black instructors are patient and allow you to have time to get into the flow after having battled everything to make it there. We take time in the beginning to connect. The instructor may ask what we would like to work on. Sometimes we introduce ourselves. The regulars give hugs. It’s a true, personal release. Black mental health and wellness seem to be at a low with social media constantly having everyone in flux. These real-time highs and lows can give you an unrealistic view of your personal situation and your community, so we need to take the time to explore ourselves if we want to be efficient in the things we are trying to do. We have to stay grounded and of a sound mind because there is so much important work to be done to build/rebuild our communities. That means continuing to excel and stack resources instead of letting our emotions get the best of us. As far as body image goes, I’ve always had the opposite problem of most people I know. I have a lot of trouble keeping weight on, and when I work out, I can easily get to be way too muscular for my liking. People say it’s not an issue but then everybody wants to be “thick.” Either way, yoga makes me feel positive about my body image because it doesn’t make me feel TOO muscular like weight lifting does and it also doesn’t cause me to lose any weight. I feel like black yogis are extremely UNDER-represented. When you go to large yoga events, we are few and far between. My favorite pose is forearm stand, or pincha mayurasana, and it is oh so obvious! It’s my favorite because I would see a yogi that I met before I started practicing posting pictures of herself doing it and it seemed impossible. I was amazed. It was my ultimate goal pose. When I got it within a couple years of practicing, I felt like I could do anything! Everything about myself is random, it seems! But, randomly, I love to study Chinese language and culture. I even visited China once for two months. I recommend for ladies to get a yoni egg to use during practice (despite potential humiliation). It can help to find and get more in touch with an important energy center that can help you get deeper into many poses. I can’t bring myself to advertise any brands when I don’t personally know the one(s) behind the label.